Rolling down your local rink floor, you feel the wind in your hair as you glide smoothly across the surface. Your skates are barely making a sound as you effortlessly push again to pick up speed. One of the key parts of a roller skate that make this silky smooth speed a possibility are roller skate bearings. Roller skate bearings are one of the most important and crucial parts of a roller skate. Bearings are what allow the roller skate wheel to move on the axle or hub of the roller skate frame. Having the right bearings and insuring they are clean and properly maintained leads to that smooth, soundless ride we all desire. What is a Roller Skate Bearing? Example of a roller skate wheel with a bearing already installed. Lets break down the roller skate bearing into more detail. It’s a fairly misunderstood roller skate component, so in this article, I am going to start with the super basics and then go into detail about it so you really understand this crucial part of your skate. First, lets identify where bearings are located. Grab a pair of your favorite skates and turn it on it’s side so you can look at one of your wheels closeup. As you look at one of the wheels, it should look something like this picture to the left. The silver metal circle in the middle of the wheel is the roller skate bearing. 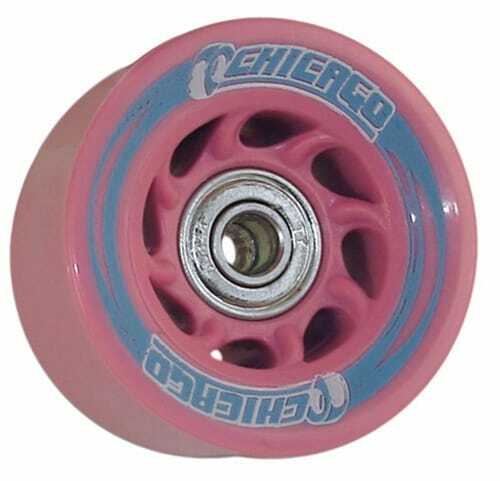 Every roller skate wheel has two individual bearings on either side of the wheel. One in the front and one in the back. The bearings are inserted into the wheel usually by pressing them in with your hands. There is a picture of my favorite bearings, Bones Super Reds*, to the right as a closeup so you can see how they look when they are new, clean and not already in a wheel. However, the reason the bearing is needed is because your wheel attaches to your skate boot via a skate plate (#1 in the diagram to the left). Sticking out at the bottom of every skate plate are four skate axles (#11). They are the thin, long metal where the wheels attach. The bearing fits inside of the wheel and the wheel with the bearing inside of it slides over the axle. The wheel is then secured to the axle via an axle nut (#9). As you can see from the diagram, there are a lot of other components, but I wanted to keep it simple. If you want a lot more details on the overall anatomy, there is a really great skate plate breakdown over at Derby Warehouse. I highly recommend using their interactive skate anatomy diagram to understand your skates better. Understanding your skates better will really help you take better care of them, and more importantly knowing your skates helps to keep you safe. This probably is obvious to you now, but if you didn’t have bearings, then the axle would either need to be much bigger or the whole in the wheel would need to be much smaller. Then, you would also have the huge problem of your rubber wheel rubbing up against the metal axle directly, which would not get you very far as the wheel would no longer roll (not to mention that your rubber wheel would be damaged quickly). Now that we have located the roller skate bearings, lets dig into an individual bearing itself and understand how it works in more detail. This area will focus on roller skate bearings, but it is very similar for most ball bearings. Ball bearings are used in all kinds of different applications. Your clothes dryer, the lazy susan spice tray, your car and of course your roller skates, which is what we are here to talk about. The shield is usually a rubber ring that goes on the outside of a bearing. It is used to protect the insides of a bearing from dirt, water and debris. 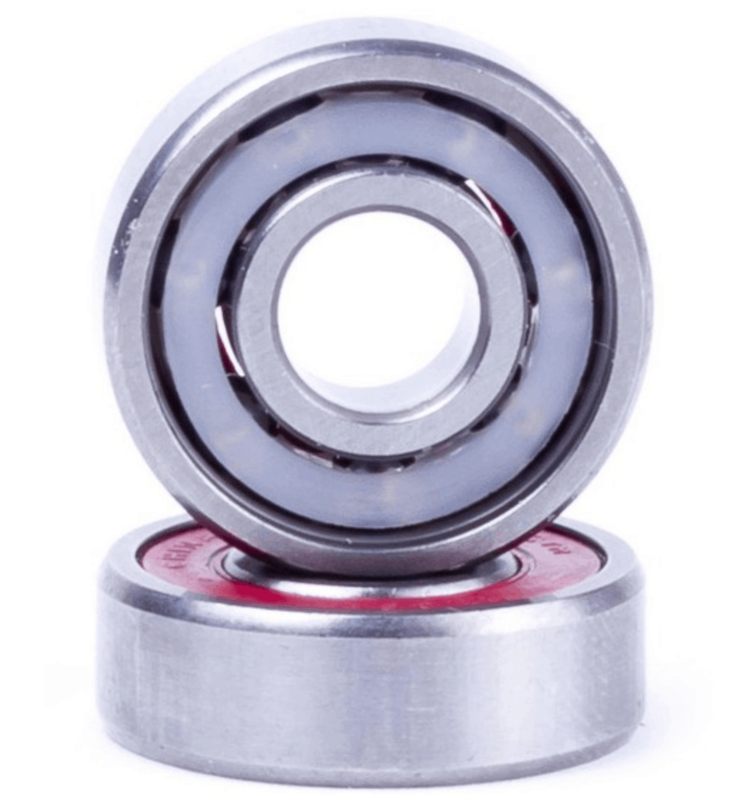 Not all bearings have a shield (some people actually like bearing without a shield for the extra noise it makes), but most roller skate bearings do to help protect them. The inner race is the inner most cylinder of the bearing. It is one half of the bearing that the ball bearings roll against. 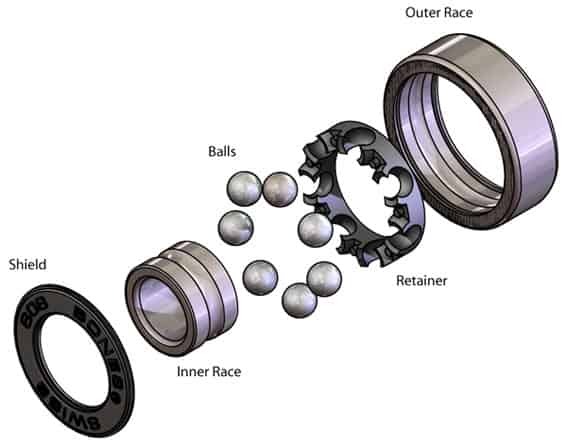 Just like the inner race, the outer race is the outer cylinder of the bearing. It is the other half of the bearing that the ball bearings roll against. These little, perfectly round balls are where the magic happens. 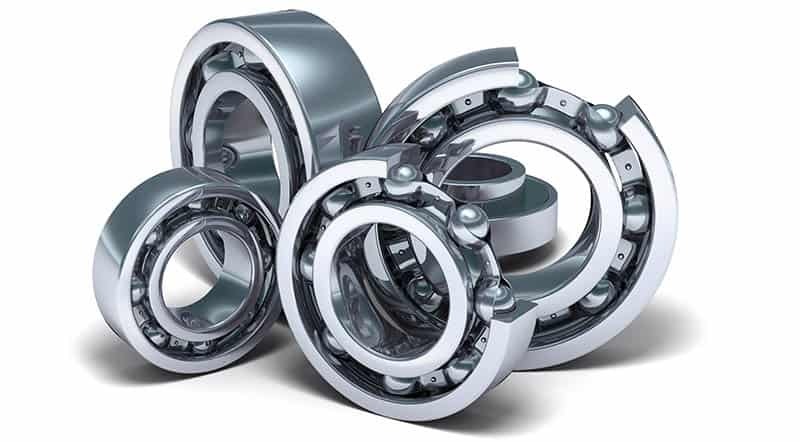 The ball bearings roll inside the inner and outer race making the bearing turning over and over again. The inner race is connected to the axle and allows your wheel to roll. Some skate bearings have a retainer that helps keep the ball bearings separated equally from each other in the outer and inner raceways. If you are looking to replace your current roller skate bearings, I personally use Bones Super Reds bearings in all of my roller skates. I find that they are both cost effective (about $50 for a set of 16 – remember you need 16 bearings for roller skates – 8 wheels x 2 bearings / wheel) and one of the better bearings on the market. They are metal bearings and they are pretty easy to keep clean and maintain, too. I do most of my skating indoors at my local rink here in Austin, Texas, so I find that the cheaper metal Bones Super Reds are the way to go for me. After 6-12 months, I usually just get a new set for myself. However, you can use acetone cleaners to clean your bearings and keep them for a very long time – more on that in a future article. Until next time, thanks for stopping by and keep on rollin’! Thank You very much for this informative information. Greatly appreciated. I should have had some of this information many years ago. Keep up the good work. Thank you, Pat, for stopping by! Thanks, Eliane, for stopping by. Hope to hear from you again soon! What do you think of the Qube 8 Ball bearings? I’ve seen them recommended for heavier riders. Thanks for rolling by Natalie. I had a set of Qube 8 Blacks before I got turned on to Bones Super Reds by some folks at my local rink. Its funny that you ask this question. As I am thinking back on it, the Qube 8 was the reason I started looking for a new skate bearing. So weird. I really didn’t like them…at least the set that I had. The set I got felt sluggish and slow. I was impatient at the time (I’m much better now :-). I really should have tried figuring it out (lubing the bearings, realizing it was probably my wheels, etc. ), but I just wanted to skate so I started asking folks and was told to try Bones out. I got a set of Bones on Amazon and I really haven’t switched to anything else. I will be doing a more in-depth articles on roller skate bearings in the future, so stay tuned. And, thanks for stopping by!